An “Italian Fashion Show” was planned in 2011 during the Wine Tasting of the GALA ITALIA featuring the collection, jewelry and fashion accessories for men and women of a well known Italian designer. The show, was set up on the large stage of the Grand Broadway Ballroom and much appreciated, attracted the attention of the public to yet another aspect of the MADE IN ITALY, and has received ample TV coverage. During the Fashion Show some renowned Italian artists were featured. Star Chic’s participation in “Gala Italia” marks a further step on its pathway to success. For the “easy couture” brand created by Simona Ventura with Federica de Pompeis, taking part in this prestigious all-Italian event represents an official “debut” in the United States. There will be the presentation of the Fall/Winter 2009-2010 collection, which is all the more appealing and fresh with novelties, offering a combination of glamour and comfort as befits the brand’s DNA. Star Chic was created on the basis of a careful analysis of the clothing attitude of women, and of its most recent evolution. Looks are suitable for a wide range of age groups and uses, but feature a basic/daily/lounge style that brings to mind a wardrobe philosophy belonging to self-assured, confident women, who also have a soft spot – as women do – for novelty and seduction. The key must-have item in Star Chic’s range, with its sporty/chic, casual/refined style, removed from any branding pressure and always cool, is undoubtedly the leisure suit. “A morning-till-evening leisure suit,” states Simona Ventura, “solves our lives”. Offered in infinite variations – all of which original and extraordinarily attractive – in chenille, sponge and now even cashmere, often featuring precious and glamorous embroideries and decorations, applications and prints, the suits truly are multi-faceted and special, “Just like women, and only women, can be,” claims Simona Ventura… Star Chic is a work-in-progress, and the brand’s latest novelties are very interesting: the new collection as a matter of fact also includes a Men’s capsule collection. Soon, little girls will also be able to wear Star Chic: mini-looks for mini-fans have already been planned. Raffaella Curiel was born in Italy and launched in to the Fashion World as a 3rd family generation of Couturierès, after classical education in Milano and London, she began working in the French tradition under Pierre Balmain and under the watchful eye of her Mother. Her Mother Gigliola who after the second world war and especially during the sixties dressed International and Italian bourgeois and aristocracy had been the very first designer to sign an exclusivity contract with Bergdorf Goodman in New York and Harrod’s in London in 1949-1950. From the outset Raffaella did things in her own way. Collections that symbolize a particular line, color or cut that maybe trendy, she prefixes themes, which she then reinterprets in a modern way. She dedicated runway shows to Schiele, Klimt, Beardsley, Velasquez and Vermeer, to Jim Dine and Picasso, and yet, to writers such as Victor Hugo or Proust or to India, Russia or Mexico of Frida Khalo that she presented in November 2008 in Mexico City and Guadalajara. She is and been invited all over the world with her collections. A magazine writer once noted: ” She is a woman of a thousand faces, that could box in a circle and at the same time create the magic of the sphere “. Raffaella has a wonderful “following”, her daughter Gigliola Jr, called Gigi, beloved by international Press and clients and who has her own line of Ready To Wear. She also creates all kinds of accessories. Both Raffaella and Gigi adore New York and America where they have numerous important clients and where they visit every month since 1980. Aimée, which means “loved” in French was established in 1961 by the Gonzaga family. In 1983 the company became a corporation under the CEO’s, Dr.Matthias Kissing and his wife, Mrs. Lucia Zanotti, in correlation with the President, Dr. Rolf Kissing. 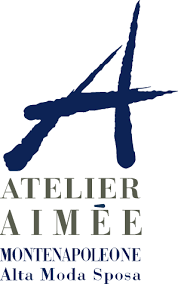 The growth of Atelier Aimée started in the late 80’s. Today it is the largest bridal gown company in Italy and can be found in the most prestigious boutiques throughout the world. Atelier’s three collections include : Atelier Aimée Montenapoleone, Emé di Emé le spose, Pret a Porter di Atelier Aimée Montenapoleone. Each line appeals to a different bridal aesthetic. There are over 300 new styles created and produced each year. All production takes place in Italy, where our factory near Mantova employs 150 people. Each gown is created with the time-honored craftsmanship that Italian design is known for, complete with hand-finishing. Our Research and Design department, led by our head designer and artistic director, Lucia Zanotti, is at the forefront of Italian and international haute couture, ensuring our collections remain fresh and vibrant. Atelier Aimee has worked with several leading designers and institutions such as: Gianni Versace, who asked creative director Lucia Zanotti to create exclusive bridal collections for his boutiques; Lancetti, a fixture on the catwalks of Rome’s Alta Moda, which turned to Atelier Aimee to create its line of bridal gowns; Gucci, which had us produce gowns for Hollywood stars due to our expertise in couture detailing; Dolce & Gabbana, who turned to Atelier Aimee to create exclusive handmade gowns for the VIP line of its boutiques. Brioni was founded in 1945 on Rome’s Via Barberini by master tailor Nazareno Fonticoli and Gaetano Savini, who was the manager of sales, as well as the firm’s public relations officer. Using a revolutionary approach that respected English traditions of cut, taste and materials, while aiming to create an innovative Italian style, they named their company “Brioni,” after the island resort near Trieste. From the outset, Brioni was an innovative shop that, with a series of monumental firsts, succeeded in creating a fundamental shift in menswear that changed the fashion industry forever. The first to host a men’s fashion show, Brioni was also first in introducing bright, bold colors to men’s clothing. The first menswear company to use silk for more than simply lining, Brioni was also the first to create proper suits made from cotton, rather than traditional linen. Brioni invented the “trunk show” and by stocking a wide range of exclusive goods, created what years later was to become “The Total Look.” With an unerring eye for detail and remarkable radicalism, Brioni also changed the silhouette of the modern suit when it introduced the “Columnar Look” that made headlines wherever the clothes were shown. The suit garnered rave reviews because it cut against the grain in popular men’s fashion by streamlining the silhouette, tapering the trousers, simplifying the details and eliminating all excess. For more than 60 years, Brioni’s revolutionary approach has succeeded in attracting a loyal clientele of jetsetters, world leaders, moguls, royalty, movie stars and aristocrats. Rooted in a profound respect for the art of hand-tailored elegance, this approach fearlessly challenged conventional notions and in the process created and continues to celebrate timeless Italian style.